Meter readings and energy-saving notes for dual fuel use at home in 2012. We became a 'SuperHome' with nominal carbon savings of 62%. 2012 data (kWh: e used 1542, e gen -3778, g 3707). 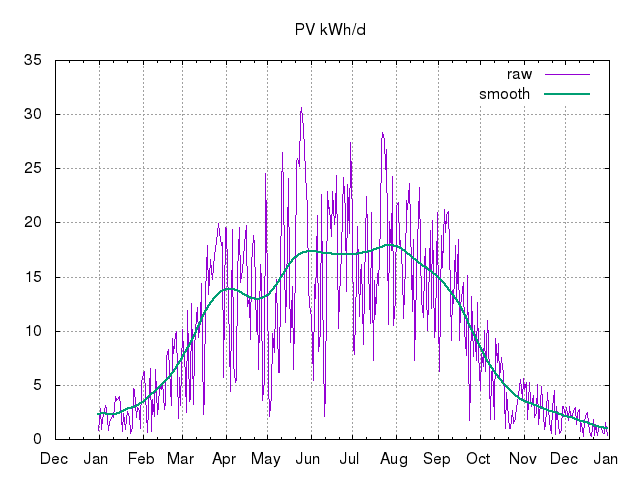 See the daily PV generation logs for 2012 as .csv and .png chart. We became a 'SuperHome' (number 119) early in 2012. We have nominal carbon savings (ignoring our PV) of 62%. 2012/01 174 (5.6/d) -75 (-2.4/d) 669 (22/d) 20111231-18:12-GMT to 20120131-18:42-GMT (31d) Meter readings: electricity generation 75.3kWh, export 47.1kWh, import 145.6kWh (thus net consumption (I+G-E) 158.8kWh); gas ~60.3m^3 (so 669kWh @ 11.1kWh/m^3). Electricity target missed for month with dehumifier on a lot to try to keep below 70%RH in the kitchen especially when laundry drying. Gas target missed (592kWh@169HDD for central heating) also, at ~3.1kWh/HDD, possibly also because of different attempts to keep humidity in check. 2012/02 153 (5.3/d) -148 (-5.1/d) 653 (23/d) 20120131-18:42-GMT to 20120229-18:11-GMT (29d) Meter readings: electricity generation 148.2kWh, export 113.3kWh, import 117.7kWh (thus net consumption (I+G-E) 152.6kWh); gas ~58.8m^3 (so 653kWh @ 11.1kWh/m^3). Electricity (t:153kWh) missed and gas (t:549kWh CH) hit target for month. Was still using dehumidifier a little to control RH. HDD12=211 vs 132 last February. 2012/03 139 (4.5/d) -371 (-12/d) 328 (11/d) 20120229-18:11-GMT to 20120331-17:18-GMT (31d) Meter readings: electricity generation 370.6kWh, export 370.6kWh, import 96.1kWh (thus net consumption (I+G-E) 139.3kWh); gas ~29.5m^3 (so 238kWh @ 11.1kWh/m^3). From second week had MHRV off and windows open selectively, moved ADSL off-grid. Near end of month passed 10MWh on first generation meter, and turned central heating off. HDD12=109 vs 146 last March; this one was third warmest on record. 2012/04 117 (3.9/d) -409 (-14/d) 147 (4.9/d) 20120331-17:18-GMT to 20120430-17:01-GMT (30d) Meter readings: electricity generation 408.9kWh, export 362.9kWh, import 70.9kWh (thus net consumption (I+G-E) 116.9kWh); gas ~13.3m^3 (so 147kWh @ 11.1kWh/m^3). Electricity and gas targets met for month. I believe that the MHRV has probably helped with gas/heating in particular by helping us trap heat when available. Passed 12MWh generation total according to (slightly conservative) SunnyBeam. HDD12=108 vs 33 last April and 82 in April 2010; this April was wettest for over 100 years and very gloomy at times. 2012/05 128 (4.1/d) -524 (-17/d) 174 (5.6/d) 20120430-17:01-GMT to 20120531-21:15-GMT (31d) Meter readings: electricity generation 524.0kWh, export 460.0kWh, import 64.0kWh (thus net consumption (I+G-E) 128.0kWh); gas ~15.7m^3 (so 174kWh @ 11.1kWh/m^3). HDD12=42 vs 24 last May and 66 in May 2010. 2012/06 103 (3.4/d) -507 (-17/d) 148 (4.9/d) 20120531-21:15-GMT to 20120630-18:23-GMT (30d) Meter readings: electricity generation 507.6kWh, export 443.6kWh, import 39.3kWh (thus net consumption (I+G-E) 103.2kWh); gas ~13.3m^3 (so 148kWh @ 11.1kWh/m^3). Experimentally we are running appliances in the day to better match generation, although it probably does not minimise carbon footprint (vs the wee hours), and imports this month were ~39kWh compared to ~61kWh last June, so in the summer months there are some real options with load shifting. Generation probably low in part because April to June this year has been the wettest second quarter in the UK since records began in 1910 and June was the second dullest recorded. HDD12=7 vs 10 last June and 8 in June 2010. 2012/07 99 (3.2/d) -534 (-17/d) 126 (4.1/d) 20120630-18:23-GMT to 20120731-17:12-GMT (31d) Meter readings: electricity generation 534.4kWh, export 470.9kWh, import 35.3kWh (thus net consumption (I+G-E) 98.8kWh); gas ~11.4m^3 (so 125kWh @ 11.1kWh/m^3). We continued running appliances/loads to match PV generation, even though the generally poor sunshine and unpredictable showers/cloud made that hard (oh for smart appliances / HAN / smart meters!). We were away on holiday the last week of July, thus low consumption figures. HDD12=1 vs 1 last July and 0 in July 2010. 2012/08 93 (3.0/d) -514 (-17/d) 101 (3.3/d) 20120731-17:12-GMT to 20120831-17:40-GMT (31d) Meter readings: electricity generation 513.5kWh, export 457.5kWh, import 37.2kWh (thus net consumption (I+G-E) 93.2kWh); gas ~9.1m^3 (so 101kWh @ 11.1kWh/m^3). We continued running appliances/loads to match PV generation; next month we switch back to make the effect on imports clear in the monthly stats. Most of the family was still away on holiday at the start of this month, and there other short breaks from home, thus low consumption figures. This was probably the second-wettest summer on record. It was chilly enough on the night of the 30th for condensation on the insides of the kids' (old 2G) windows at ~8°C. HDD12=2 vs 2 last August and 4 in August 2010. 2012/09 126 (4.2/d) -391 (-13/d) 165 (3.3/d) 20120831-17:40-GMT to 20120930-16:55-GMT (30d) Meter readings: electricity generation 391.3kWh, export 341.8kWh, import 76.4kWh (thus net consumption (I+G-E) 125.9kWh); gas ~14.8m^3 (so 165kWh @ 11.1kWh/m^3). Electricity target just missed, gas target met for month. This month we switched back to running washing machine and dishwasher at night to minimise carbon footprint rather than our bills (first dishwasher run in early hours of 1st Sept, though ran dishwasher maintenance hot wash during gloriously-sunny 9th) to make the effect on imports (doubling!) clear in the monthly stats. We had some dew outside our new triple glazing, which shows it working. HDD12=17 vs 6 last September and 19 in September 2010. 2012/10 119 (3.8/d) -164 (-5.2/d) 152 (4.9/d) 20120930-16:55-GMT to 20121031-18:00-GMT (31d) Meter readings: electricity generation 164.1kWh, export 135.3kWh, import 90.3kWh (thus net consumption (I+G-E) 119.1kWh); gas ~13.7m^3 (so 152kWh @ 11.1kWh/m^3). ADSL/broadband modem went back on-grid 5th Oct when off-grid battery getting low and not much sunshine was forecast. Energy bills before Big 6 rises announced predicted cost for next 12 months at current rates of ~£190 for electricity (1.0MWh) and ~£250 for gas (3.4MWh). Central heating not on yet! Dehumidifier run from time to time when RH above 70% (on ~4 days). Was in DECC smart heating workshop! HDD12=55 vs 31 last October and 62 in October 2010. 2012/11 149 (5.0/d) -90 (-3.0/d) 366 (12/d) 20121031-18:00-GMT to 20121130-18:03-GMT (30d) Meter readings: electricity generation 90.0kWh, export 61.6kWh, import 120.7kWh (thus net consumption (I+G-E) 149.1kWh); gas ~33.0m^3 (so 366kWh @ 11.1kWh/m^3). Heating on 2012/11/06 18:15 after about 6 HDD12 each day since start of month. Total gas consumption about same as last November though much colder this. One day no electricity at all was exported to the grid (and we imported 5.3kWh). Kitchen MHRV installed 2012/11/26 (and test electronic TRV smart heating 2012/12/15 in one bedroom); significant dehumidifier use until then, including ~10l water removed in one day! HDD12=133 vs 66 (347kWh gas use) last November and 185 (654kWh gas use) in November 2010. 2012/12 142 (4.6/d) -50 (-1.6/d) 677 (22/d) 20121130-18:03-GMT to 20121231-18:41-GMT (31d) Meter readings: electricity generation 49.9kWh, export 29.5kWh, import 121.8kWh (thus net consumption (I+G-E) 142.2kWh); gas ~61.0m^3 (so 677kWh @ 11.1kWh/m^3). Failed CRT TV replaced with lower-power larger-screen LED-backlit LCD model. A detailed analysis of energy by day shows, for example: a max gas consumption of 40kWh on one day, an apparent baseline of 9.2kWh/d and slope of 2.1kW/HDD12 for gas, and an almost complete lack of correlation between electricity and HDD. I also compute what electricity imports would be if gas heating were replaced with various CoPs of heat-pump, ignoring cooking. HDD12=190 vs 154 last December and 328 for 2010; a fairly mild winter so far. 663kg (1.8/d) -1625kg (-4.4/d) 710kg (2.0/d) ~-0.26tCO2 (~-0.70kgCO2/d) gas/electricity emissions total for 4 people, based on 0.43kgCO2/kWh for electricity (netted) and 0.19kgCO2/kWh for gas, ie slightly carbon negative. First published 2012-01-01 , updated 2019-04-22 , rebuilt 2019-04-23 . Site copyright © 2007-2019 Damon Hart-Davis. Hosted by ExNet.